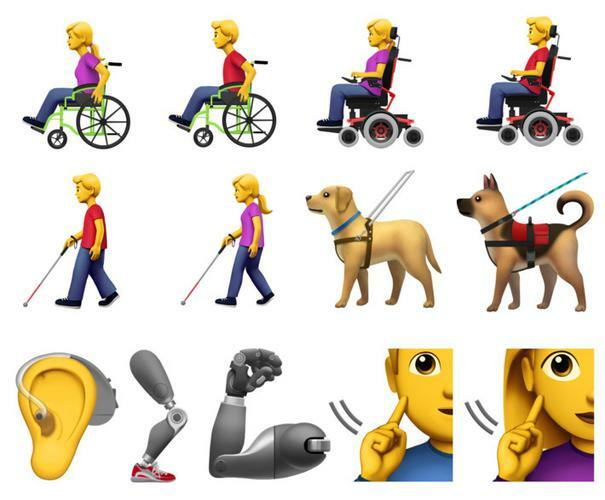 An emoji update set for release this year will include icons representing a range of disabilities, introducing emojis for deaf people, blind people, people in wheelchairs, and those with prosthetic limbs. The Emoji v12.0 list of 230 new emojis released by The Unicode Consortium includes a guide dog, service dog, ear with a hearing aid, deaf person, a woman and man in a motorised wheelchair, in a manual wheelchair, with a walking cane, as well as a walking cane, mechanical arm and mechanical leg. The company is responsible for defining which emojis appear on all platforms including iPhones, Android devices and computers. Vision Australia manager government relations Chris Edwards welcomes the emoji update. “I think these new emojis are terrific,” he says. “They demonstrate the world is seeing diversity as the norm highlighting we are living in a more inclusive society. Mr Edwards says it’s important that inclusive emojis are developed to reflect the diversity of our society. The update is a response to Apple’s request last year to expand the scope of people that can be represented including people with disability. Co-Chief Executive Officer, People with Disability Australia Matthew Bowden is thrilled to see the inclusive emojis. “We’re delighted to see some disability diversity being represented at last in this release of new emojis – this has been something that many members of the disability community have been calling for. The new emojis will appear on iOS, Android, Windows, applications like WhatsApp and web platforms Twitter and Facebook later this year. You can view the full list of emojis v12.0 here.